How to Prove "All" Differential Equation Properties. School of Computer Science, Carnegie Mellon University, CMU-CS-16-100, 2016. School of Computer Science, Carnegie Mellon University, CMU-CS-14-138, 2014. School of Computer Science, Carnegie Mellon University, CMU-CS-14-121, 2014. School of Computer Science, Carnegie Mellon University, CMU-CS-13-129, 2013. Erik Zawadzki, André Platzer, and Geoffrey J. Gordon. A Generalization of SAT and #SAT for Robust Policy Evaluation. School of Computer Science, Carnegie Mellon University, CMU-CS-13-107, 2013. David Renshaw, Sarah M. Loos and André Platzer. Mechanized Safety Proofs for Disc-Constrained Aircraft. School of Computer Science, Carnegie Mellon University, CMU-CS-12-132, August 2012. David W. Renshaw and André Platzer. 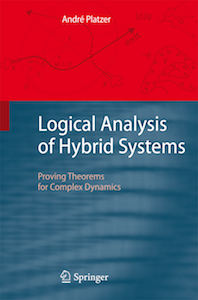 Differential Invariants and Symbolic Integration for Distributed Hybrid Systems. School of Computer Science, Carnegie Mellon University, CMU-CS-12-107, May 2012. School of Computer Science, Carnegie Mellon University, CMU-CS-11-111, 2011. School of Computer Science, Carnegie Mellon University, CMU-CS-10-126, 2010. School of Computer Science, Carnegie Mellon University, CMU-CS-10-100, 2010. Reports of SFB/TR 14 AVACS 54, 2009. ISSN: 1860-9821, www.avacs.org. School of Computer Science, Carnegie Mellon University, CMU-CS-09-147, 2009. School of Computer Science, Carnegie Mellon University, CMU-CS-09-110, 2009. Reports of SFB/TR 14 AVACS 52, 2009. ISSN: 1860-9821, www.avacs.org. Reports of SFB/TR 14 AVACS 15, May 2007. ISSN: 1860-9821, www.avacs.org. Reports of SFB/TR 14 AVACS 12, February 2007. ISSN: 1860-9821, www.avacs.org. Uniform Substitution in One Fell Swoop. Verified Runtime Validation for Partially Observable Hybrid Systems. 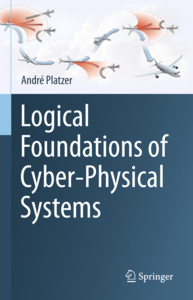 Teaching Cyber-Physical Systems with Logic.